Some suppliers call their equipment categories 'bronze, silver and gold' and others use 'blue, red and black'. We offer a wide range of kit all at very, very competitive prices through the large and respected chain of ski hire shops, Skiset. The names for our categories of equipment reflect the names that Skiset also use: Economy (the lowest quality), Evolution, Performance and Excellence (the highest quality). To get the best possible experience from your equipment (and therefore maximum enjoyment of your holiday) we recommend booking in either the 'Performance' or the 'Excellence' category. These offer the newer, better skis and snowboards which will be in the best condition. Even fairly nervous intermediate standard skiers can rent from the Performance category as there will be excellent quality skis which are suitable for those still finding their ski feet. Paying a little bit extra for your equipment can be the difference between having a good holiday and a truly great holiday. The newer and better skis will simply perform better than older models. New skis will give 'pop' out of the turns, hold an edge even on 'hardpack' and will feel stable at speed. The top category skis are safer, faster, better and so much fun. Refurbished and well maintained equipment in 3rd or 4th year of use which has been down-graded from either Evolution or Performance categories. Equipment is appropriate for every level of skier but aimed at those on a budget. Aimed at skiers happiest on green and blue slopes. Skis are easy to manage on all snow types and inspire confidence. 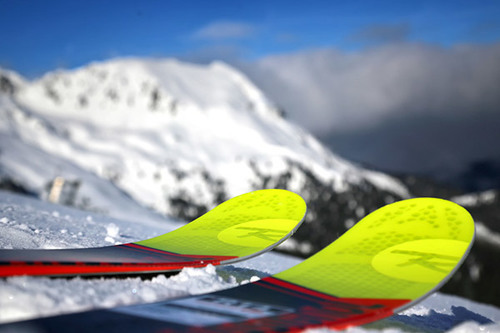 Only on-piste skis, snowblades and multipurpose snowboards are on offer. Skis and snowboards will be a maximum of 2 years (or 100 rental days) old. See list of skis and snowboards from the: Evolution category. For skiers and riders who are comfortable on all types of slope and snow conditions. High quality skis offering grip and stability even at higher speeds with on-piste, ‘all mountain’ and ‘freestyle’ models available. Snowboards on offer are either ‘all mountain’ or ‘freestyle’. Skis and snowboards will be a maximum of 2 years (or 80 rental days) old. See list of skis and snowboards from the: Performance category. For experienced and demanding skiers. A selection of the top skis which cover all types of terrain both on and off-piste. World Cup race skis, piste skis, ‘all mountain’, ‘freestyle’ and ‘free-ride’ models are available. Skis and snowboards will be no more than a year (or 45 rental days) old. See list of skis from the: Excellence category. We regret that we cannot guarantee the availability of ski or snowboard boots for adults with feet larger than UK size 12. If you wish to rent boots for either skiing or snowboarding and you are size 13 or above please do contact us first. For younger children who are just starting out on skis. See list of skis from the: Mini Kid category. This category of skis would suit abilities from beginner up to and including 2 star level under the ESF (Ecole Ski Francais) awards system. At 2 Star level your child is able to create a series of 10 or more basic controlled parallel turns over a marked slalom course on a moderately steep slope. Can handle hollows and bumps on a traverse and direct downhill descent with control; side-slip with full edge control and execute the basic skating step. Approximately 2-4 weeks ski experience depending on age and ability. See list of skis from the: Kid category. For children who have attained their 3 Star level and beyond. This category offers high quality skis (including racing and twin tip skis, and junior snowboards). Equipment can be changed mid-week for a small supplement paid locally. At 3 Star level your child is able to create a series of 10 or more perfectly parallel controlled turns with correct pole plant technique and upper body position over a marked slalom course on a moderately steep slope. Be able to ski in a perfect straight line descent to build up high speed finished with a braking side-slip to stop at a given point, all on a moderately steep slope. Execute a series of joined side-slips and edge controlled traverses. Approximately 5-6 weeks ski experience depending on age and ability. See list of skis and snowboards from the: Rider Junior category. This category offers high quality skis (including racing and twin tip skis, and junior snowboards). Equipment can be changed mid-week for a small supplement paid locally. See list of skis and snowboards from the: Rider Junior category. For younger children who are just starting out on skis. Please note in Austria children simply hire either Kid skis or Junior Rider snowboards. There is no Mini Kid category in Austria. This category of skis would suit abilities from beginner up to and including 3 Star level ability under the ESF (Ecole Ski Francais) awards system.